As I continue to add a variety of more raw foods to my diet, I continue to search for breakfast options that go beyond eating only fruit or green smoothies. During the winter months, I always loved making cooked steel cut oats. To shorten the cooking time in the morning, I would put the oats in a pot with water and let it sit overnight. The oats soften and voila! – they cook up in no time. That led me to search for ways to have raw oatmeal using soaked oats. As I searched the internet, the recipe I liked the best was one by Angela Stokes Monarch. I use her basic recipe, which includes the soaked oat groats (not rolled oats- these are the oats used for the steel cut variety), raw honey, lucuma powder (a low glycemic sweetener made from a fruit that grows in Peru), maca, cinnamon, and water. I add other superfoods like hempseeds, bee pollen, and chia seed gel, which is simply chia seeds in water. The Chia seeds soak up the water like a sponge in a matter of minutes. This gel can be stored in the refrigerator for a couple of weeks. I’ll blog more about Chia in upcoming posts. enough water to blend to desired consistency. This will be about ¼ – ½ cup of water. Add water slowly so you don’t add too much or the oatmeal will become watery. You can top the oatmeal with extra cinnamon, sliced banana or apple, berries – whatever you like. 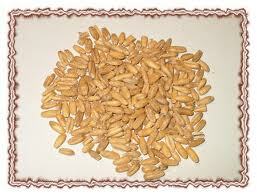 You can buy oat groats in bulk at a ridiculously low cost. They are high in both fiber and protein. This is a really filling breakfast that will power you up till lunch. I love it!